Italian sanctions on Russia will not affect export of etrog fruits for Sukkot holiday, rabbi says. The Italian government said that the export of Italy-grown etrog fruits to Russia will not be affected by sanctions imposed by the European Union against Moscow, Russia’s chief rabbi said. An agreement reached last year exempts from sanctions the export of the citrus fruit, which Jewish communities use as a religious artifact during the week-long holiday of Sukkot. Basing his understanding on statements from a local Italian government, Rabbi Berel Lazar told JTA that the agreement also applies to June's extension of the sanctions. Speaking to JTA from the Italy's southern region of Calabria on Friday, Lazar said, “The local government here said that because this is a religious product, they are going to make sure no sanctions are going to be applied on the etrogim.” He added the etrogim are imported by Russia as a religious article, exempt from taxation. Lazar was born in Milan to a Chabad rabbi, Moshe Lazar, who for the past 50 years has been responsible for supervising the export of etrogim in Calabria. Exporting needs to be done carefully, to ensure easily-bruised fruit, meet the highest standards and are not harmed or rendered non-kosher. Berel Lazar traveled to Calabria to help his 83-year-old father with the harvest. Chabad-Lubavitch hasidim share a strong preference for the Calabria-grown etrog, and tens of thousands of Calabria etrogim are picked annually for export. The Italian orchards owned by approximately 100 farmers. Etrogim also are grown in Israel and Morocco. Chabad communities are major engines of Jewish life in the former Soviet Union and especially in Russia. The European Union in June extended a list of sanctions on Russia, including on exports and imports, in reaction to Russia’s annexation in 2014 of Crimea, an area internationally recognized as belonging to Ukraine. The prospect of sanctions is not the only challenge facing the etrog industry in Calabria. An unexpected frost this winter severely damaged the sensitive etrog trees, destroying approximately 90 percent of the crop, Moshe Lazar told JTA. This applies to Russia, too, said his father Berel said. 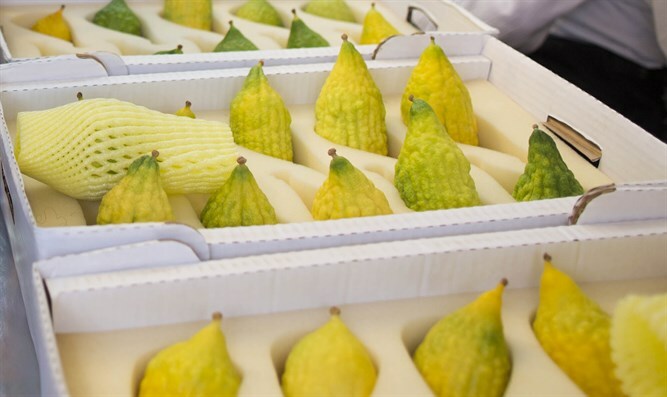 The shortage has hiked up prices, with a prime Calabria etrog going for approximately $500, according to Rabbi Avraham Wolff of Odessa, Ukraine. “We’re worried we may not have a Calabria etrog and we’re pulling all possible string to get at least one,” Wolff said. In previous years, his community was able to purchase five individual Calabria etrogim ahead of the holiday. “We decided to set up a small fund for buying that Calabria etrog, no matter the price,” he said. Immediately after sukkot, the prices of Calabria etrogim drop to about $1 a pound, Berel Lazar noted. The local population uses the fruit to make jam.